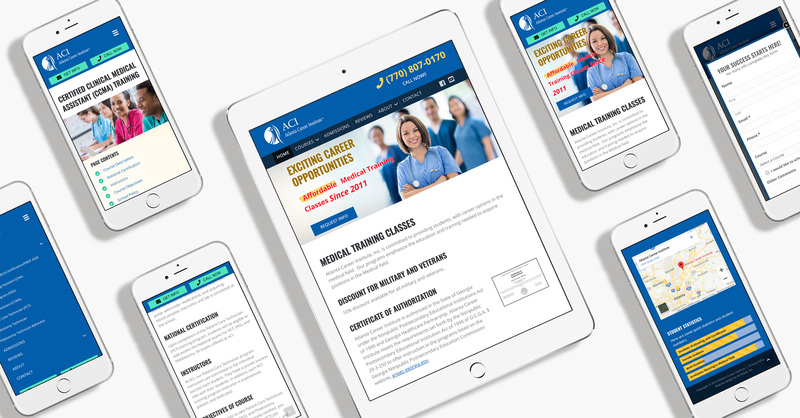 Atlanta Career Institute—located in Atlanta, GA—has been providing affordable medical career training since 2011. They contacted Art Wave after seeing our work on a similar website. Their old website wasn't mobile-friendly, needed better search optimization, and they wanted to see if students could apply and pay deposits online. Our solution was to build a custom WordPress website and use Zapier's API to integrate the application form with their Quickbooks Online account. The results have been amazing with over 80% of applications coming in online versus paper applications sent by mail. This proves that students do prefer to apply and pay online, and it's more efficient for the school too. Another primary goal for the new website was to make the website truly mobile-friendly with responsive web design. More than 65% of their web traffic is on mobile devices. Judge the results for yourself with these before and after screenshots. We think you'll agree the new design is better but the proof is in the pudding. Google Analytics show that website traffic and conversions are almost the same across all device types and screen sizes. The screenshots below show how clean and user-friendly the website is on any size screen. Note how the call-to-action buttons on mobile devices stay visible on the screen as the page scrolls. We enjoyed working with ACI and look forward to a long relationship. If you like this website, give us a call and see what we can do for you!